Funeral services will be 1:00 p.m., Wednesday, December 5, 2018 at Behrens-Wilson Funeral Home with Pastor Bruce Baum officiating. Interment will follow at Black Hills National Cemetery. 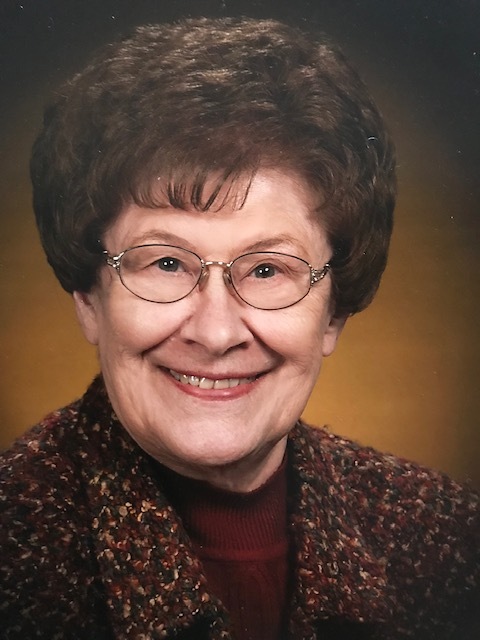 Grace Erdahl Mickelson, 92, Rapid City, died Friday, November 30, 2018 at Westhills Village Healthcare. She was born in Rake, Iowa on May 22, 1926 to Albert Martin and Amanda (Gunderson) Erdahl. In the mid-thirties the family moved to Forest City, Iowa, where Grace graduated from high school in 1943 and Waldorf College in 1945. In 1947, Grace graduated from the University of Iowa in June with a B.A. Degree. The following month, on July 26, 1947, she married John Chester Mickelson of Rockford, Illinois. John was a graduate student at Iowa. They had four children, Judy, John Jr., and Barbara were born in Pullman, Washington, between 1950 and 1954 and Becky was born in Lewistown, Montana, in 1956. After several moves around the West, with John working for Standard Oil of Ohio, the family moved to Rapid City in 1961 when John joined the faculty at the South Dakota School of Mines and Technology. Grace began teaching mathematics that year at Central High School. In the late 60’s, Grace served as President of the Rapid City Education Association, and was the first woman to serve as full time president of the South Dakota Education Association in 1972. Grace joined International Toastmistress Club in Lewistown, Montana, in 1954, continuing her work through ensuing moves of the family. After holding council and regional offices in ITC, Grace held all international offices serving as ITC President in 1968 while living here in Rapid City. Grace was appointed to the South Dakota Senate in 1972, and was elected to two more terms. She was only the second woman in South Dakota history to be elected to the State Senate. Grace was elected by her fellow legislators to the Legislative Research Council and its three-member executive committee. In 1972 she completed her Master’s Degree at Black Hills State University and in 1979 she received her PHD at the University of Wyoming. President Jimmy Carter appointed Grace Deputy Principal Regional Official and Director of Intergovernmental Affairs for the Department of Health and Human Services for Region VIII in Denver. She served from 1978-81. Grace taught mathematics at Douglas High School from 1981-91 when she retired from teaching. She served as Chairman of the Department there. Public service has been continual. She was elected to the Rapid City Common Council in 1995 and served two years. Her service to Rapid City covers many years. She served for six mayors: Mayor Baker on his Priority Council; Mayor Allman on his Advisory Council; Mayor Barnett on his Convention Center Finance Committee; Mayor Carlyle on a joint city-county-school committee on school funding; Mayor Shaw as chairman of a joint city-county committee protecting our drinking water; a position she continued under Mayor Munson. Grace served as legislative Chairman for Business and Professional Women and for the American Association of University Women. She was a life member of ITC, SDEA, NEA, AAUW, Black Hills and South Dakota Retired Teachers and the SD Historical Society. She was a long time member of the National Organization for Women and Habitat for Humanity. Grace is survived by her three daughters, nine grandchildren, thirteen great-grandchildren, one sister and two brothers. She is preceded in death by her husband and son. A memorial has been established and donations may be sent to the Grace Mickelson Scholarship SDSM&T.